The unfinished railroad tunnel cut into the SE face of Stumphouse Mtn. 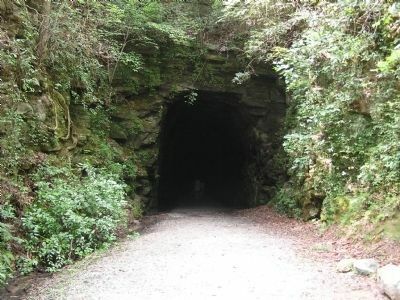 is the largest of three begun before the Civil War by the Blue Ridge Rail Road, for a line from Anderson, S.C., to Knoxville, Tenn. Work began in late 1853. 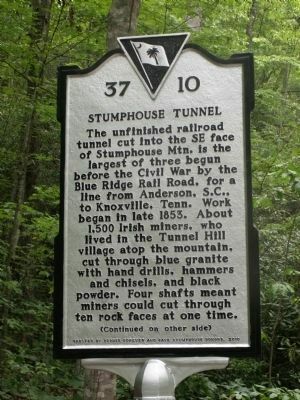 About 1,500 Irish miners, who lived in the Tunnel Hill village atop the mountain, cut through blue granite with hand drills, hammers and chisels, and black powder. Four shafts meant miners could cut through ten rock faces at one time. 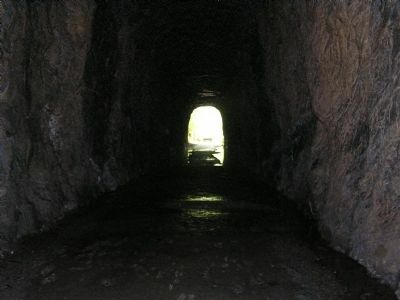 (Continued on other side) (Reverse) (Continued from other side) Stumphouse Tunnel was the westernmost tunnel of the three; Middle Tunnel was ½ mi. SE and Saddle Tunnel was 1¾ mi. NE. The longest section of this tunnel is 1,600' long, 25' high, and 17' wide. Work ceased in 1859 when the S.C. legislature refused to fund more construction. Clemson University acquired the tunnel in 1951 and cured blue cheese here for several years. 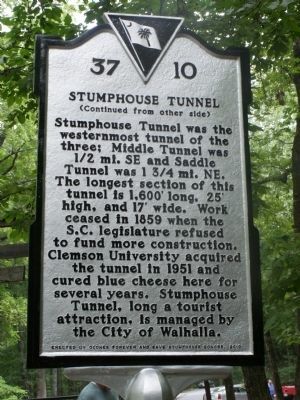 Stumphouse Tunnel, long a tourist attraction, is managed by the City of Walhalla. Location. 34° 48.621′ N, 83° 7.414′ W. Marker is in Walhalla, South Carolina, in Oconee County. Marker can be reached from Stumphouse Tunnel Road half a mile east of Highlands Highway (South Carolina Highway 28). Touch for map. Marker is in this post office area: Walhalla SC 29691, United States of America. Touch for directions. Other nearby markers. At least 8 other markers are within 4 miles of this marker, measured as the crow flies. Stumphouse Mountain Tunnel (within shouting distance of this marker); Issaqueena Falls (approx. 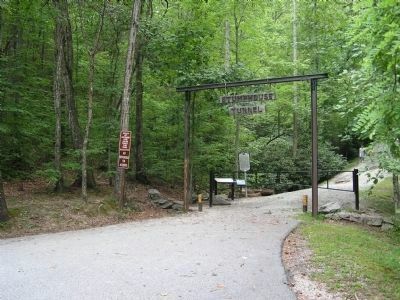 ¼ mile away); Andrew Pickens Ranger District / Oconee County (approx. ¼ mile away); Oconee Town (approx. 3.9 miles away); The Oconee Waterwheel (approx. 3.9 miles away); Oconee Station / Oconee County (approx. 3.9 miles away); The Civilian Conservation Corps (approx. 3.9 miles away); Civilian Conservation Corps Monument (approx. 3.9 miles away). Touch for a list and map of all markers in Walhalla. More. Search the internet for Stumphouse Tunnel. Credits. This page was last revised on June 16, 2016. This page originally submitted on August 24, 2011, by Anna Inbody of Columbia, South Carolina. This page has been viewed 1,007 times since then and 8 times this year. Last updated on June 6, 2014, by Darrell Bruggeman of Whitmire, South Carolina. Photos: 1, 2, 3, 4, 5. submitted on August 24, 2011, by Anna Inbody of Columbia, South Carolina. • Bernard Fisher was the editor who published this page.